Its been 8 months since I started the interview process with FB and now that I have some time on my hands, I’m writing about everything I did, how I got the interview and the interviews themselves. Please keep in mind that I am no expert and that there was some factor of luck involved in my selection, and not everything I say here is 100% correct. Also do keep in mind that FB and Palantir were the only off-campus placement opportunities I pursued, so again I’m very inexperienced in these matters. In general, its possible to apply to any company from their online portal. FB also has a nice portal where it autofills a lot of the data and then you need to upload some more stuff and the application is done. Other companies, Google etc., also have a similar system set up. But from what I know and what has been told to me multiple times by my seniors, when someone applies through these portals, the probability of their resume actually reaching a recruiter and then the recruiter actually going through it is pretty slim (due to the huge number of applications). Referrals are a sort of golden tickets which atleast ensure that your resume reaches a recruiter. After that point, its the same for everyone but even such a small helping hand goes a long way. Having a referral still doesn’t guarantee you an interview/position. 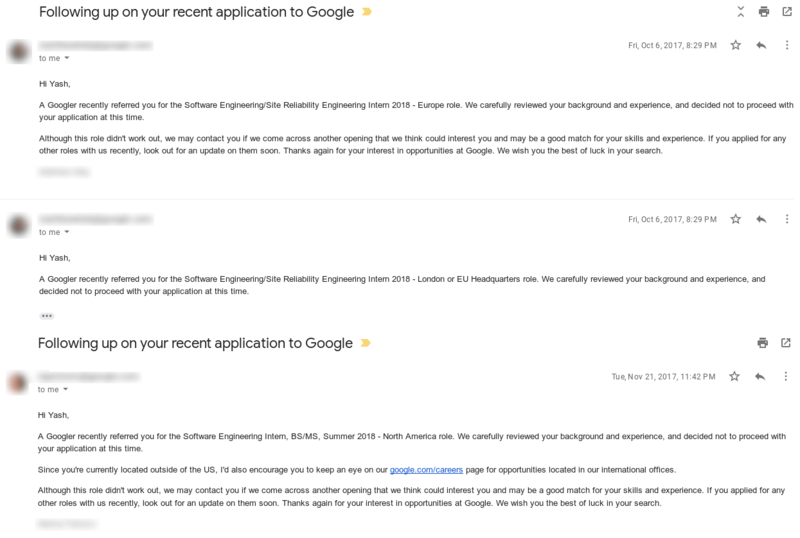 Case in point - I had a referral which I could use for any position at Google after completing GSoC. I had used it an year earlier in the hopes of getting an internship in the past summers. Remember the part about luck being involved I mentioned above, instance #1 - My friend was interning at Facebook’s London Office in the summers and hence he had 6 referrals he could use up. Fortunately, he chose to use one of the referrals to refer me for a full time position as a Software Development Engineer at Facebook’s London Office. I sent him my resume (this was the exact resume I sent) and he wrote a short recommendation note and we were good to go. This mail was on the 1st of August which was followed by a follow up mail on 6th asking about minor things like when I’ll complete my graduation and all. Once that was done, I was asked to provide a date and time when I’d be free in the upcoming weeks and my final phone interview slot was set up for August 28, 2:00 - 2:45 PM London Time. I’ll detail the phone interview in the next part.